Before I traveled to Death Valley, California last year, I was skeptical about the place. “What is there to see besides a bunch of rocks?,” I wondered. But it turns out that Death Valley National Park actually offers a lot of scenic places to see! Death Valley activities include seeing dry salt beds, brilliantly-colored rock and mineral formations, and even – if you can believe it – snow. You can hike to Telescope Peak, go camping, and drive past some cool-looking features. If you’re heading to Death Valley National Park, consider checking out these five points of interest! 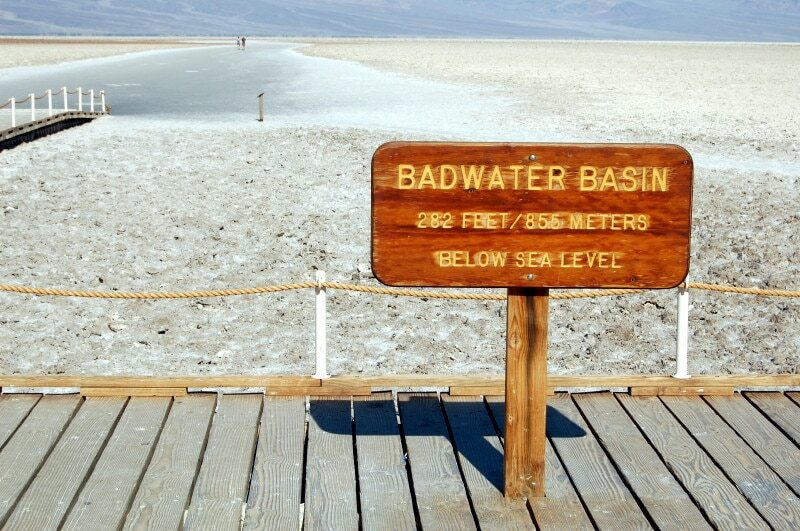 Every visitor to Death Valley stops by Badwater Basin, the must-see spot that makes the park famous. 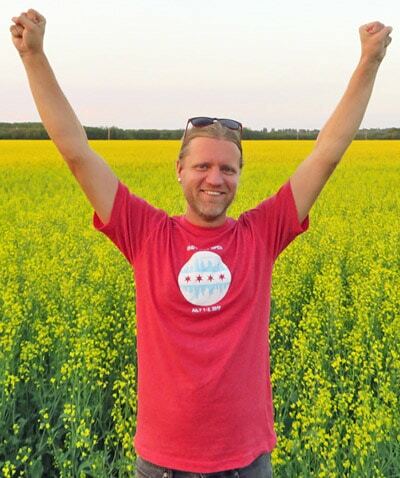 At 282 feet below sea level, it’s the lowest elevation in North America. The temperature rises to well over 100 degrees here during the summer, but it’s not as dry as you’d think. There’s a small pond here called the Badwater Pool. The water is much saltier than the ocean, and only a few small marine organisms can survive in it. Visitors are encouraged to walk out on the basin, but during the summer months when the temperature routinely reaches 120 degrees, you should take care not to walk too far from your vehicle and to have plenty of water on hand. Keep yourself hydrated! I never expected that I could stand in Badwater Basin in May with the temperature at 107 degrees and look over and see snow on a nearby mountain, but that’s one of the surprises Death Valley offers. 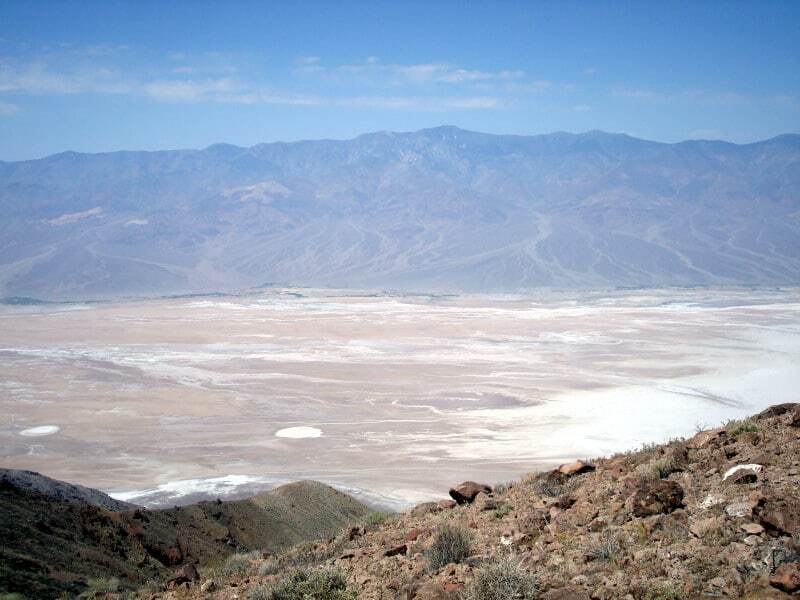 Telescope Peak in the Panamint Mountains has an elevation of 11,049 feet. 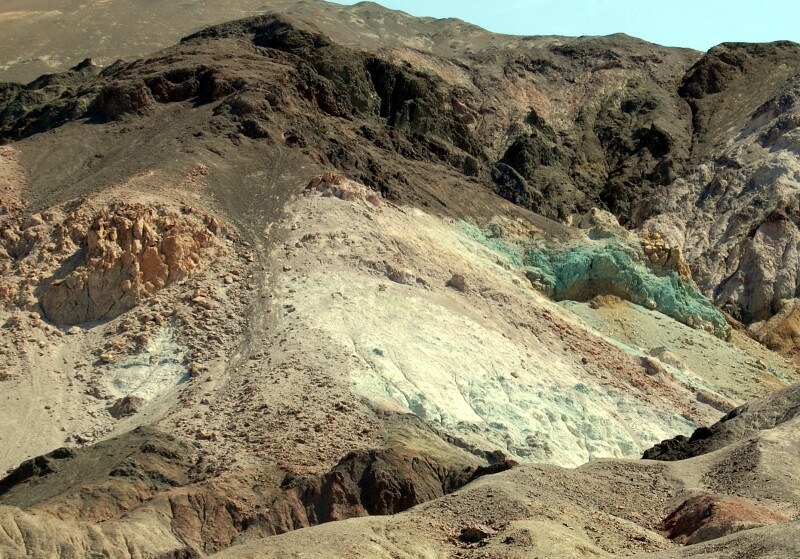 One of the most adventurous Death Valley activities is hiking to Telescope Peak. If your vehicle is up for it, you can drive along a gravel road to the trailhead at 8,000 feet, then hike seven miles to the peak. The round-trip is a strenuous, seven- to nine-hour trek. Keep an eye out for bighorn sheep during your journey! Go during summer, or you’ll need an ice axe, crampons and other professional climbing gear. Artist’s Palette is a section of the Black Mountains where the rock is colored brilliant shades of green, orange and purple. The colors emerge due to weathering and the oxidation of various metals in the area. It’s one of the coolest places to see in the park. You can see this section of Death Valley by following a nine-mile one-way road through the edge of the mountains. Feel free to pull over and hike into the hills to see even more magnificent colors hidden from the view of the road. For a wonderful view of Badwater Basin and the surrounding mountains, head to Dante’s View in the Black Mountains. The viewpoint more than 5,000 feet above the basin provides some of the best views in Death Valley. The Mesquite Sand Dunes were formed by years of wind blowing sand into an area nearly surrounded by mountains. The highest dune stands about 100 feet tall and serves as one of DV’s top points of interest. Hike through the dunes or take photographs and enjoy the scenery. Sunset is said to be the best time to take photos. Just watch for the sidewinder rattlesnakes in the area. Several Hollywood movies filmed scenes here, including multiple Star Wars films, so fans of that series should consider checking out the dunes. 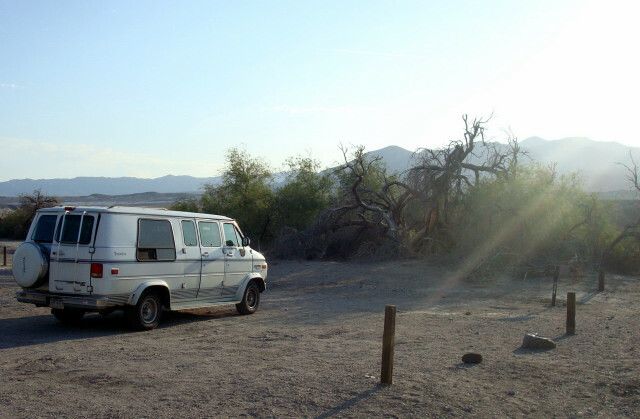 Death Valley National Park has some primitive campgrounds. Because of the extreme heat, many are not staffed during the summer, but you’re still welcome to pull in and set up camp. During my visit in May I grabbed a spot at the Furnace Creek campground. I thought I might be the only crazy person camping there since it was already summer, but at least a dozen other travelers had the same idea. Sleeping under the stars while coyotes howled throughout the night was one of the most memorable experiences I had in Death Valley. 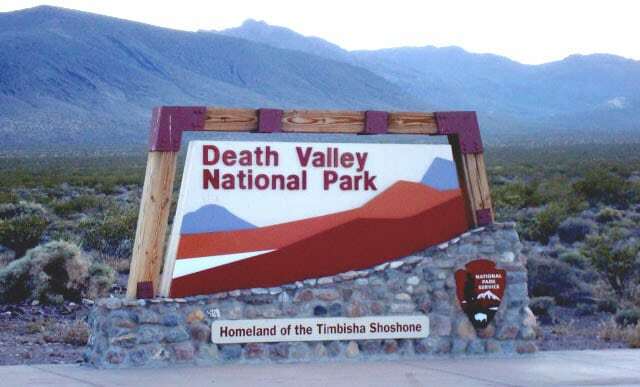 Check out Death Valley’s official website for more ideas on things to see and do. Be sure to stop by the Furnace Creek Visitors Center when you arrive to inquire about points of interest or any other questions you may have about Death Valley activities. Here’s a link to the Death Valley visitor guide and map of attractions as of 2019 (PDF), courtesy of the National Parks Service. Keep in mind that a January or February Death valley visit is very different than a visit during July or August. So be aware of the weather and come prepared with plenty of water and the appropriate type of clothing for the season. And don’t forget to visit the cool ghost town of Rhyolite, Nevada, located not far from Death Valley’s eastern border! It’s one of the most interesting ghost towns in America. Death Valley is also within a few hours’ drive of the desert oasis of Palm Springs and the Las Vegas area, including stunning Red Rock Canyon. Thanks, it’s a cool place. I am doing a report on death valley and your information helps a lot! Seems like a fun place to go. But I haven´t been there yet. Death Valley is definitely worth checking out if you get a chance. Thanks for reading! Yes, it is kind of out of the way from Las Vegas. My favorite national park. Soooo much to see. And so many things that just can’t be experienced anyplace else. I recorded two podcasts on Death Valley and it just made me want to book a flight and rent a 4wd vehicle to head up to the racetrack to see where rocks mysteriously travel across the flat cracked earth. I wish I had a 4WD to drive up the mountain. I wanted to reach the snow! So true about Telescope Peak. Went to DV prepared for summer heat in shorts and flip flops — randomly decided to stay at the campground near the trailhead to Telescope Peak and got freaking snowed under in the night!! Death Valley. Snow! Whodathought?! Beautiful view from the campground though. Ouch… that makes for a cool story though, Jill! Kali camped in Death Valley years and years ago with his family. There was an awful sand storm that night and sand came pouring under the flaps of the tent. Apparently they had to put his baby brother in the middle with a blanket covering his head so sand didn’t get into his eyes, then Kali and his parents had to spend the night sleeping in the corners of the tent so it wouldn’t blow in on them! Which has made me a little wary about camping in Death Valley, lol. Good point… I can see how that might happen. 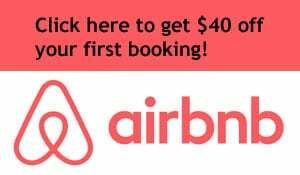 Perhaps staying in an RV would be the way to go. In the summers Thorndike, Wildrose, and Mahogany Flat are great places to camp. You’re crazy to try and camp at furnace creep from may-september! go up to the mountains, its beautiful, the stars are even better, and best of all, it’s FREE! Good idea… if I knew about the other campgrounds at the time I would’ve been better off going there!